The Hoving Home is a non-profit organization that serves women ages 18 and over who struggle with drug addiction, alcoholism, prostitution, and other life-controlling problems. It is a residential home that aims to help women with their addictions using a spiritual-based approach. The Hoving Home is named after Walter Hoving, the former chairman of Tiffany & Company, and has been featured by several major news outlets including the Los Angeles Times, Fox News, and the Christian Broadcast Network. For Hoving Home’s new logo, we decided to go with something simple that presented a powerful image. The primary icon of the logo is an outline of a house to signify what the Hoving Home ultimately is — a place where you feel safe, loved, and are surrounded by those you care about the most. The frame of the logo contains two H’s, representing the Hoving Home. In the upper center of the door is a heart, symbolizing that all who come to the Home, no matter their past, are welcomed with love. As a whole, this logo communicates the Hoving Home’s core message of love and forgiveness, which is exactly what we were hoping to achieve. 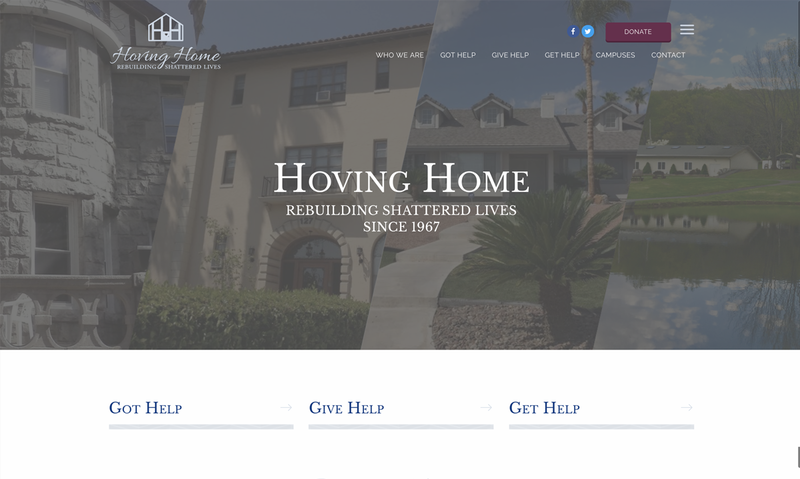 For their new website, the Hoving Home wanted something that grabbed the eye and visually expressed the transformative and healing power of their program. The website’s color palette features deep blue, dark maroon, and light grey. These colors do a great job of pulling the eyes in and down the page. They also express feelings of change, hope, and healing. The website features stories of women who found success at the home and now lead happy and productive lives. It has information about the Home’s history, its staff at its four campuses, and how volunteers and donors can help support the Home. There’s also an event page that features Home-sponsored events and a media page for the Home to showcase its extensive media coverage. 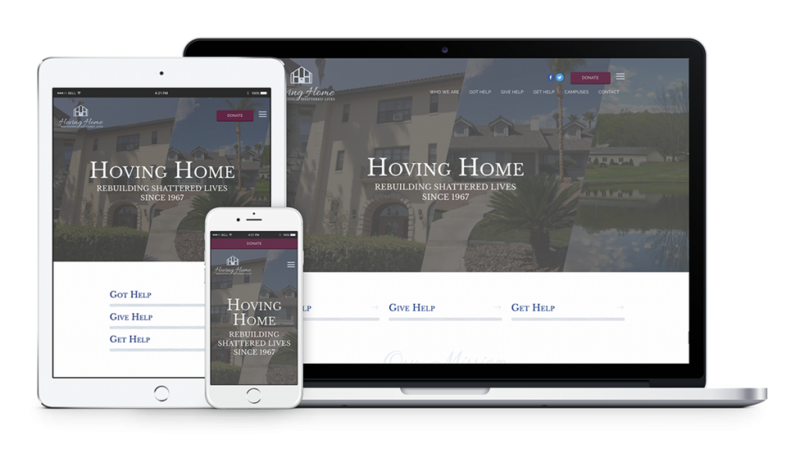 Hoving Home’s website was built on WordPress so that site administrators would have an easy time changing content and adding pages as they pleased. The site also utilizes responsive design so that it fits perfectly on any device. The Home’s new website gives them greater functionality and a more impactful look. We are truly honored to have had the opportunity to work for an organization that has done so much to improve the lives of women and wish them even greater success with the help of their new website.